All the JPA annotations are defined in the javax.persistence package. Hibernate EntityManager implements the interfaces and life cycle defined by the JPA specification. 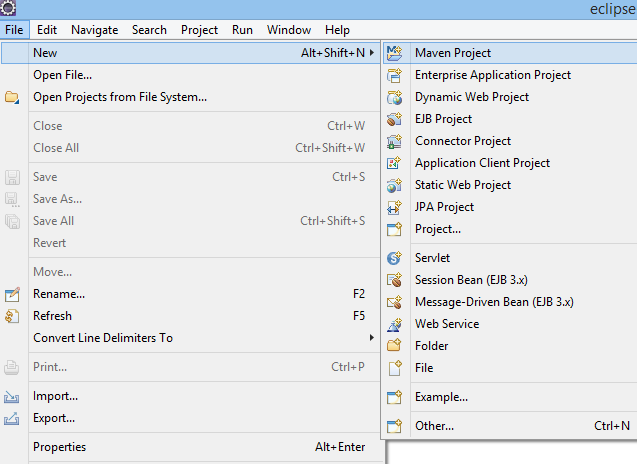 To create the maven project left click on File Menu - New- Maven Project. 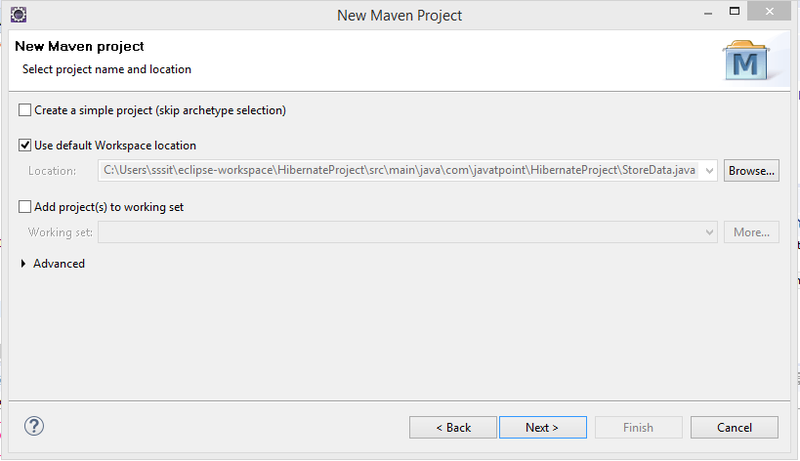 The new maven project opens in your eclipse. Click Next. 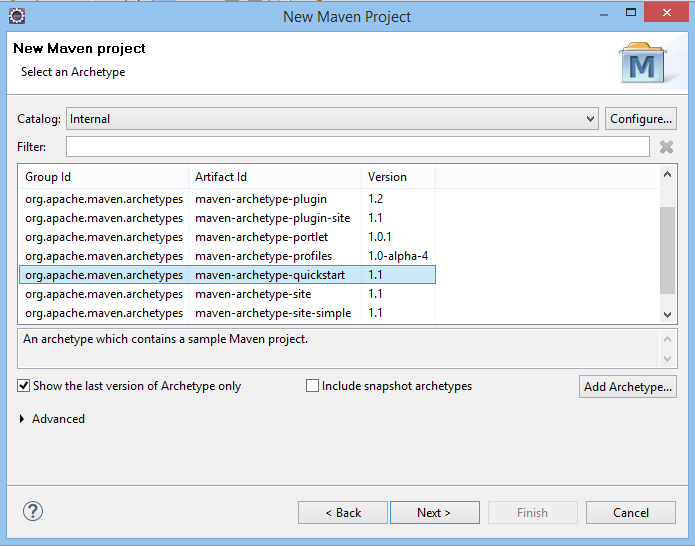 Now, select catalog type: internal and maven archetype - quickstart of 1.1 version. Then, click next. Now, specify the name of Group Id and Artifact Id. The Group Id contains package name (e.g. 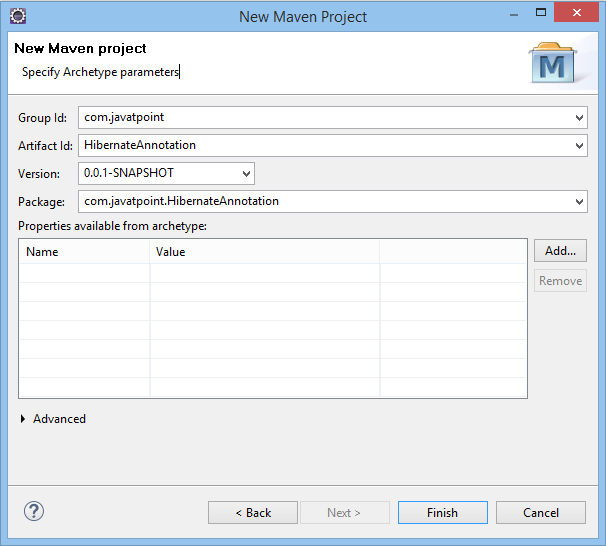 com.javatpoint) and Artifact Id contains project name (e.g. HibernateAnnotation). Then click Finish. Open pom.xml file and click source. Now, add the below dependencies between <dependencies>....</dependencies> tag. 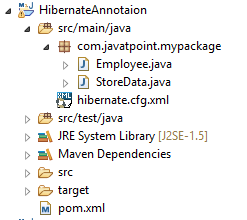 These dependencies are used to add the jar files in Maven project. 3) Create the Persistence class. Here, we are creating the same persistent class which we have created in the previous topic. But here, we are using annotation. @Table annotation specifies the table name where data of this entity is to be persisted. If you don't use @Table annotation, hibernate will use the class name as the table name by default. @Column annotation specifies the details of the column for this property or field. If @Column annotation is not specified, property name will be used as the column name by default. To create the Persistence class, right click on src/main/java - New - Class - specify the class name with package - finish. To create the configuration file, right click on src/main/java - new - file - specify the file name (e.g. hibernate.cfg.xml) - Finish. 5) Create the class that retrieves or stores the persistent object. Before running the application, determine that the directory structure is like this. To run the hibernate application, right click on the StoreData - Run As - Java Application.